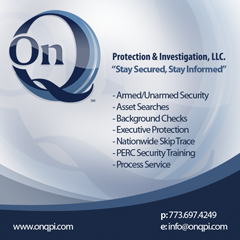 ONQPI, LLC is seeking On-Call/Part-Time Security Officers to work in the Chicago Metropolitan area and surrounding suburbs. Individuals must have a minimum of two years experience in the private security industry or possess a two year degree or higher in Criminal Justice. All candidates must have their State Of Illinois PERC card, will be required to pass a background check and are subject to a drug test prior to employment. All newly hired officers must complete the required ONQPI, LLC orientation/training before being placed on any assignments. Individuals with prior military or law enforcement experience will be selected to join our Executive Protection Division. Please send your resume to jobs@onqpi.com. Our Part-Time staff is given priority to any Full-Time opportunities that are offered. ONQPI, LLC is seeking On-Call/Part-Time Surveillance Investigators to work in the Chicago Metropolitan area and surrounding suburbs. Individuals must have a minimum of two years experience in the private investigation industry or possess a two year degree or higher in Criminal Justice. All candidates must have their State Of Illinois PERC card, will be required to pass a background check and are subject to a drug test prior to employment. All newly hired surveillance investigators must complete the required ONQPI, LLC orientation/training before being placed on any assignments.